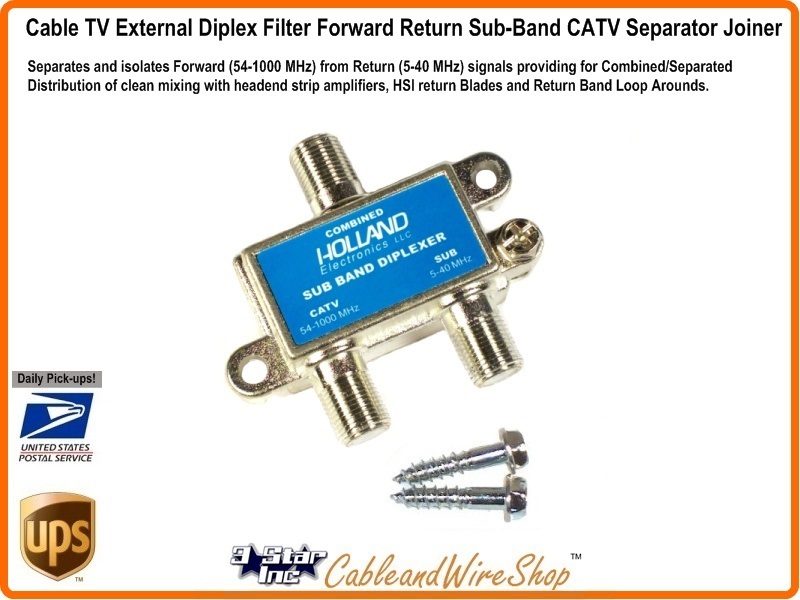 Separates and isolates Forward (54-1000 MHz) from Return (5-40 MHz) signals providing for Combined/Separated Distribution for clean mixing with headend strip amplifiers, HSI return Blades and Return Band Loop Arounds. Allows the combining or separating of return signals sub-bands (5-40 Mhz) and forward signals (54-1000 Mhz). Also provides low loss sub-band signal insertion in the distribution system or at the head-end at RG-6 Coaxial Cable Level, allowing Flexibility in combining network lay-out and design. Allows one-way amplifiers to become two-way. Separates return signals (sub-bands) on head-ends and provides low loss sub-band signal insertion in the distribution system or at the head-end.